The term NAFTA stands for North American Free Trade Agreement and it covers United States, Canada and Mexico, it makes NAFTA the world’s largest free trade area in terms of GDP. The agreement was signed in 1992 by US President George Bush, Canadian Prime Minister Brian Mulroney and Mexican President Salinas. However it was not signed into law until December 8, 1993 by President Bill Clinton. It was swiftly enforced on January 1, 1994. The channel for NAFTA began with President Ronald Reagan who lobbied for creating a unified North American Market. The concept of NAFTA is to promote economic growth by easing the movement of goods and services between United States, Canada and Mexico. This concept already existed even before NAFTA was created. In 1984 Congress passed the Trade and Tariff Act signed in 1988 and went in effect in 1989. The Canada-U.S. Free Trade Agreement which could be a forerunner of NAFTA is now suspended because of NAFTA. The ratios of Mexican tariffs on U.S. imports were 250% higher than U.S. tariffs on Mexican imports prior to the introduction of NAFTA. 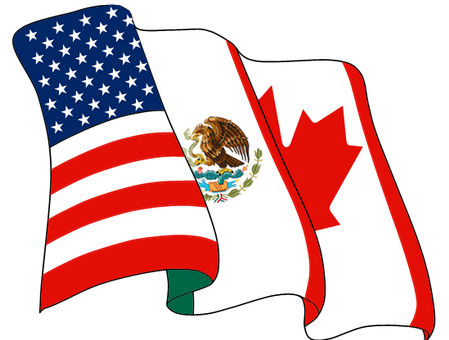 Canada requested a trilateral agreement in 1991 which led to NAFTA. In 1993 concerns about liberalization of labor and environmental regulations led to the adoption of two additions to NAFTA. Grant the members a status of Most Favored Nation. Remove barriers to trade and facilitate the cross-border movement of goods and services. Creation of procedures for the resolution of trade disputes. Provide protection and enforcement of intellectual property (IP) rights. Establish a framework for further trilateral, regional and multilateral cooperation to expand NAFTA’s benefits. The creation of NAFTA practically eliminated high tariffs for goods and services that were transported over the borders between the United States, Canada and Mexico. The elimination of tariffs reduced inflation which subsequently reduced the cost of imports. Apart from that, due to the elimination of tariffs the flow of goods and services between the three countries was not slowed down. This act encouraged trade between and increased capital for foreign investors. The elimination of tariffs is not the only positive impact of NAFTA on member countries. The agreement allows companies in member countries to bid on government contracts which mean that the foreign investors have equal rights as the local investors. The agreement also guarantees that they will receive fair market value for their investments because NAFTA provides a legal procedure for investors to make claims against a government if needed. NAFTA has been especially helpful in agriculture in increasing U.S. exports to Mexico. Mexico is the prime exporter of rice, soybean meal, beef, corn sweeteners, beans and apples. It is also the second largest exporter for corn, oils and soybeans. Because of NAFTA the U.S. agricultural exports to Canada and Mexico have grown drastically. A study published in the August 2008 issue of the American Journal of Agricultural Economics revealed that NAFTA increased the U.S. agricultural exports to Mexico and Canada even though most of this increase occurred a decade after its approval. Besides the distribution of goods, NAFTA also made easier expansion of services possible between member countries. Trade barriers such as strict regulations often obstruct easy trade of goods and services between borders. Because of NAFTA, the trade barriers in nearly all service sectors were eliminated. NAFTA requires authorities to use open administrative procedures and publish all regulations.